Heat setting fabric paint is necessary to make sure the design is permanent. Once this is completed, the project can be used without any concern over the paint coming off. You should carefully read any heat setting instructions that the manufacturer included with your fabric paints. It is important to follow any directions given carefully. Always make sure that your project is completely dry before attempting to heat set it. Heat set the paint before adding glitter or other embellishments. Heat setting should be done before adding dimensional paints. Heat setting should be done in a well ventilated area. Normally, spray fabric paint does not need to be heat set. However, you should still check the manufacturer's recommendations. There are four basic methods to heat setting fabric paint. Any one of them can be used with equally positive results as long as you follow the directions. You should use whichever is most convenient for you. You can heat set fabric paint by using an iron. The setting you will use will depend on the fabric that you used in your project. Use a clean, dry pressing cloth over the front of the design and iron it for two to five minutes. Do not use the steam setting or any moisture. Fabric paints set the best with dry heat. Alternately, you can iron your project inside out or from the back side. Iron at the hottest setting for five minutes. 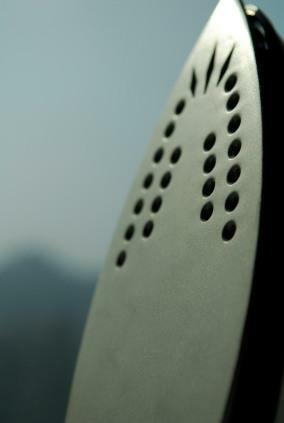 In both cases, it is important to keep the iron moving to prevent the fabric from scorching. Odd as it may sound, you can heat set fabric in the oven. Lay your completed project out on newspaper. Roll up loosely and place in an oven that has been preheated to 350 degrees for 15 minutes. Watch the fabric and paper carefully to be sure that it doesn't burn. Remove the project carefully from the oven and let cool completely. Place the project by itself in the clothes dryer. Heat to the highest setting and keep it in the dryer for an hour. If you have access to a screen printers' dryer, you can place your project in there for one minute at a 350 degree setting. Do not wash the project for two weeks after heat setting fabric paint. When it has cured for a sufficient time, you may wash it in the washing machine on gentle cycle. Use warm water and a mild laundry detergent. However, for best results and to keep your project looking new for a long time, hand washing is best. When washing painted clothing, turn the garment inside out. If it does not have glitter on it, you can put it in the dryer. Otherwise, hang or lay flat to dry. By heat setting the paint properly and treating your project carefully, you will be able to enjoy your fabric painted design for many years. There is a difference between setting dyes and paints. Double check your materials and always follow manufacturer's instructions carefully.